Sakai Guides and DocumentationAssessments and Grading AssessmentsHow do I create a student audio response question? This explains the process of adding a student audio response question (formerly called "audio recording" question) to any type of assessment. This question type presents users with a question that they must answer audibly. A recording utility opens and allows users to record the answer using a microphone. 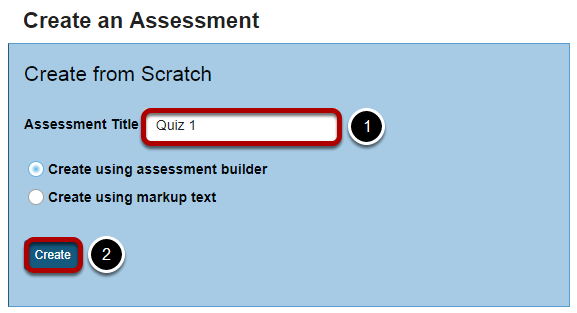 Select the Tests & Quizzes tool from the Tool Menu in your site. Questions may be added to any assessment. Select an existing assessment or create a new one. Note: You may also add a question directly to a question pool. For more information on creating new assessments, see How do I create an assessment? Or edit an existing assessment. Zoom: Or edit an existing assessment. Select Student Audio Response from drop-down menu. 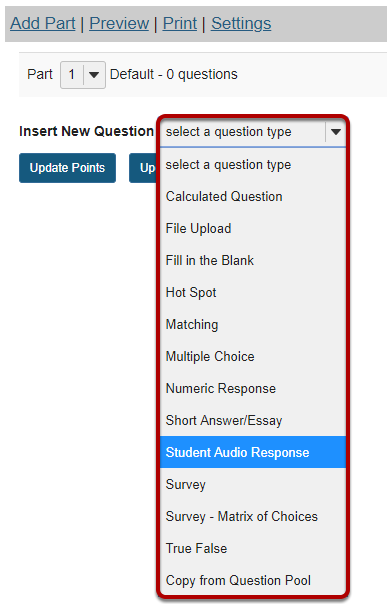 After selecting Student Audio Response, the program will open additional options for the question. Set the point value for the question. Enter the point value for this question. Questions may be worth any point value you choose. Tip: Keep in mind that the point value of all the questions in the assessment will equal the point value of the assessment in the Gradebook. So, if you want your assessment to be worth a total of 100 points, you should assign point values to your questions accordingly. Do you want students to see the point value as they are taking the test? If so, leave the default setting of Yes. If you prefer that students do not see the point value for the question, select No. Type the Question Text into the text box provided. Note: To edit with Rich-Text Editor, click the hyperlink to open the full menu. Click Add Attachments to browse for and select a file attachment if desired. This option regulates the amount of time that a student has to record an answer to a question. This time is measured in seconds. If you have multiple parts in your assessment, you may assign the question to a different part. If you have an existing question pool and would like to copy this question to the pool, select the pool name here. Feedback is optional text available for students to view after the particular question is graded. Click Save to save the question (or Cancel to exit). Prev: How do I create a survey? Next: How do I create a file upload question?